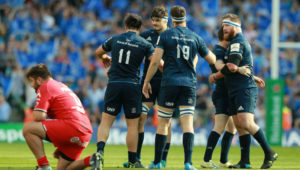 It was the boot of flyhalf Jaco van der Walt, who slotted four penalties and a conversion, that proved to be decisive as Edinburgh secured a quarter-final place for the first time since 2012, and by so doing also clinching quarter-final spots for Leinster, Racing 92 and neighbours the Glasgow Warriors. Playing in front of their home crowd at Murrayfield, Edinburgh dominated the opening exchanges and quickly opened up a nine-point lead thanks to three successive penalties that were coolly kicked by Van der Walt. 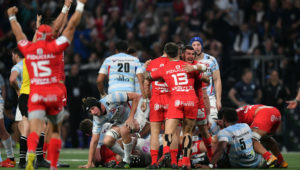 However, Montpellier hit back on the stroke of half-time when lock Jacques du Plessis grabbed a try one minute before the break, Ruan Pienaar adding a conversion to cut the deficit to just two points. Pienaar then put the visitors into the lead with his first penalty kick, but that was to be as good as it got for the Top 14 side. First, Van der Walt kicked his fourth penalty to allow Edinburgh to regain the lead. Then a collapsed maul that seemed at first certain to result in a try allowed scrumhalf Henry Pyrgos to send the ball wide to wing Darcy Graham, who sprinted in and scored what turned out to be the winning try. In the day’s other result, Toulon ended their Champions Cup campaign on a high by beating the Newcastle Falcons 27-24. A 73rd-minute try from prop Bastien Soury, after Newcastle had taken a 24-20 lead at home, allowed Toulon to clinch the win and finish third in Pool 5. 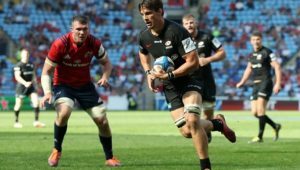 In Saturday’s fixtures, Saracens and the Glasgow Warriors, who are both assured of progression to the next round, will battle it out to finish top of Pool 3. The Cardiff Blues host Lyon, Ulster travel to the Leicester Tigers in need of a win, Racing 92 face the Scarlets, French champions Castres are up against Johan Ackermann’s Gloucester, while Munster can finish first in Pool 2 with a win against the Exeter Chiefs.